Mya definitely created a storm with their release of the Econo Mya Thunder! 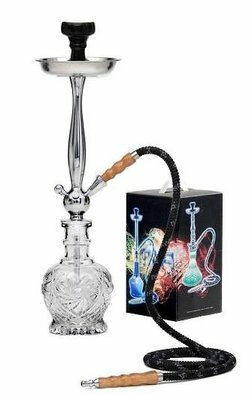 This Hookah features a crystal like vase designed to be very decorative yet durable. This storm is sure to develop some huge clouds! The Econo Mya Thunder Hookah is stored in a retail style box and is ideal for experienced Hookah users and Hookah Lounges. The Econo Mya Thunder may be converted to a four hose Hookah by utilizing stem adapters that contain the auto-seal system. The Auto Seal system eliminates the need to use rubber stoppers and flip caps when there are multiple users smoking the Hookah.